Choosing a school for your child is a delicate task with far-reaching implications. A school should ideally encourage your child’s natural interests while providing a sturdy foundation for life skills and the all-important necessities of reading, language proficiency and math abilities. 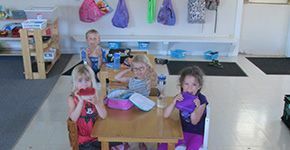 Okanagan Montessori School, utilizing the teachings of Dr. Maria Montessori, does all of this and much more while fostering your child’s confidence, independence and respect for others and the environment. Our Montessori-trained, British Columbia certified teachers have been serving the Kelowna and Okanagan communities since 1992. We have two preschool locations in the Kelowna area. To explore whether Okanagan Montessori School is right for your child, please give us a call!